Total Girl is Australia's number one tween girls' glossy magazine. Does your 6 to 13-year-old love fashion, celebrities, music and posters, Total Girl has it all. from things to make and do, to glam tips, style shoots and movie magic. She'll be reading and having fun all month long with the latest buzz, heaps of activities and laugh-out-loud stories. Amazing competitions and perf posters make each jam-packed issue a great-value offering for your tween. 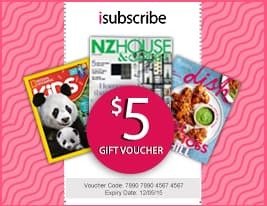 Don't miss out, subscribe now!NOTE: SUBSCRIPTION COPIES DO NOT COME WITH TOTAL GIRL FREE GIFTS AVAILABLE ON NEWSSTAND COPIES. Be the first person to tell us what you think about Total Girl (AU) and you'll save $5 on your next purchase!